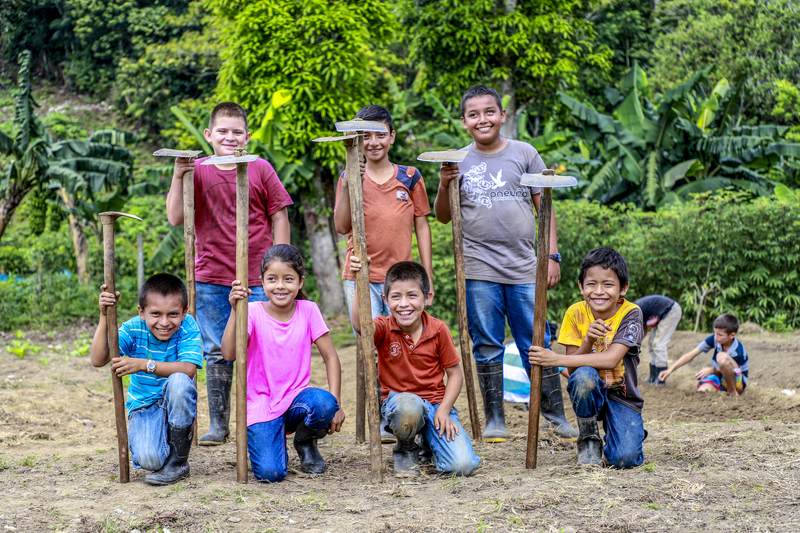 How a church in Honduras is helping families—and a community—stay together. Filadelfo simply wants to provide for his family. But with seven children to feed, it’s a struggle for this dad in Honduras just to keep his family together. In recent years, an increasing number of Hondurans are choosing to embark on the dangerous journey through Guatemala to Mexico and into the United States. But the journey is fraught with danger. Many are injured or die every year attempting to cross the border. Families are often deported or separated. That’s what one church in Honduras is working to change. Joconales, Honduras, is a small village on the border to Guatemala and home to the Tu Reino Aqui (Your Kingdom Here) Compassion child development centre. Employment opportunities are scarce, leaving most adults to work as day labourers making less than $3 CAD a day. Two years ago, an alarming trend began sweeping through Joconales. Nearly 40 families began selling off livestock and belongings to pay for the journey to the United States, in hope of a brighter future. Some families, like Filadelfo’s, sent an older child on their own. Others prepared to uproot their entire family. Most were unaware of the dangers involved. To help these families stay together and thrive in their own community, the church knew immediate intervention was necessary. 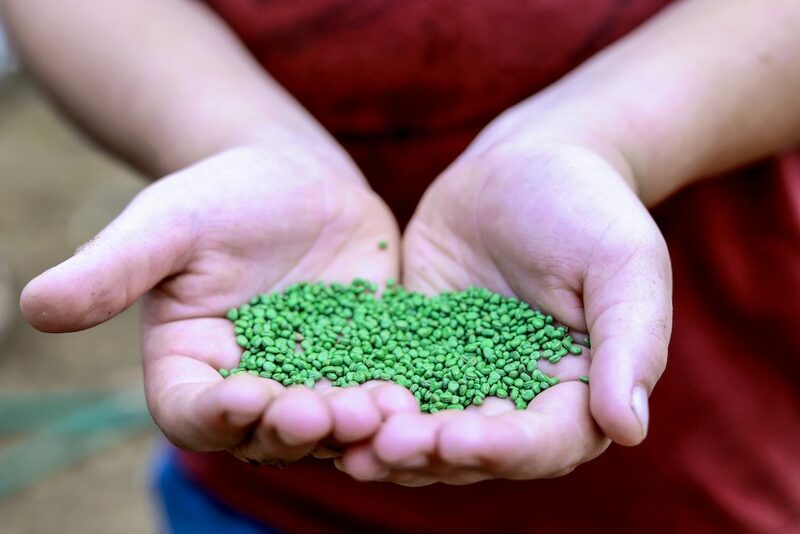 Through Compassion’s Complementary Interventions, the church provided children with a wide variety of seeds that would flourish in the temperate climate. One of the children who attends the centre holds the seeds that he was given at the project. Entire families have benefited from the new farming strategy. The tutors at the child development centre began teaching children and youth sustainable methods of planting, tending and harvesting. Together, each class tends their own plot of crops. “Every classroom was assigned a small piece of land in the backyard of the centre. Each tutor teaches their class about the sowing and the harvesting steps,” says Jorge, a tutor at the centre. “Some of the harvested crops have been consumed by the children during meals,” he continues. Hernán is holding yucca that he planted with his class a few weeks ago. 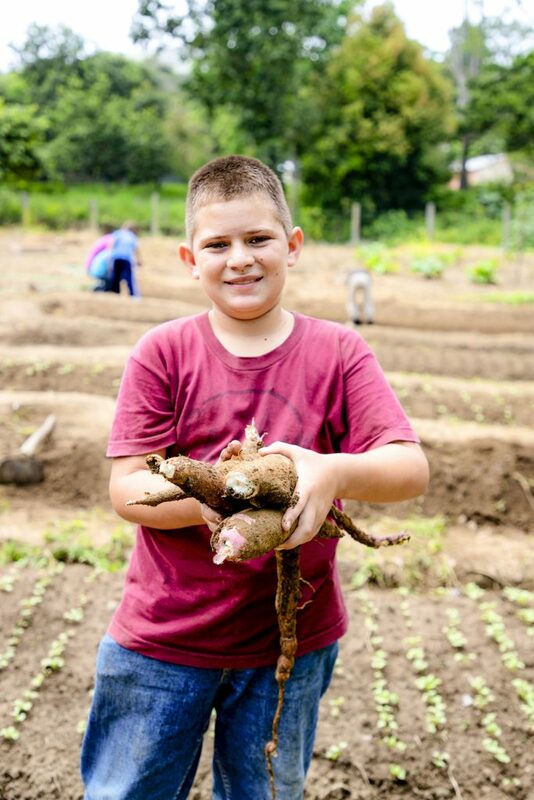 He and his classmates will enjoy this delicious yucca in one of the centre’s meals. The second step was to help the knowledge take root in the community. 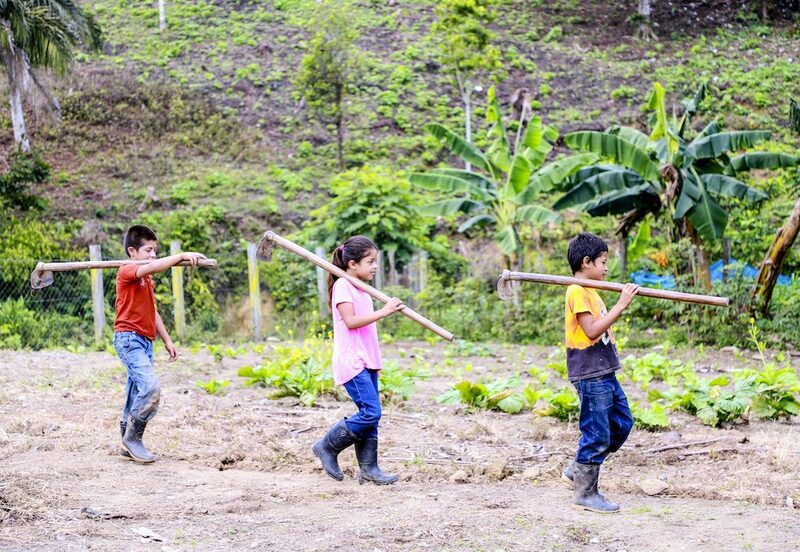 The children were given fruit and vegetable seeds, fertilizers and watering cans to bring home and were tasked with using their new skills to help their family’s plot expand and flourish. Every month, tutors visit each child’s home to see how their plot is growing, lending assistance if necessary. 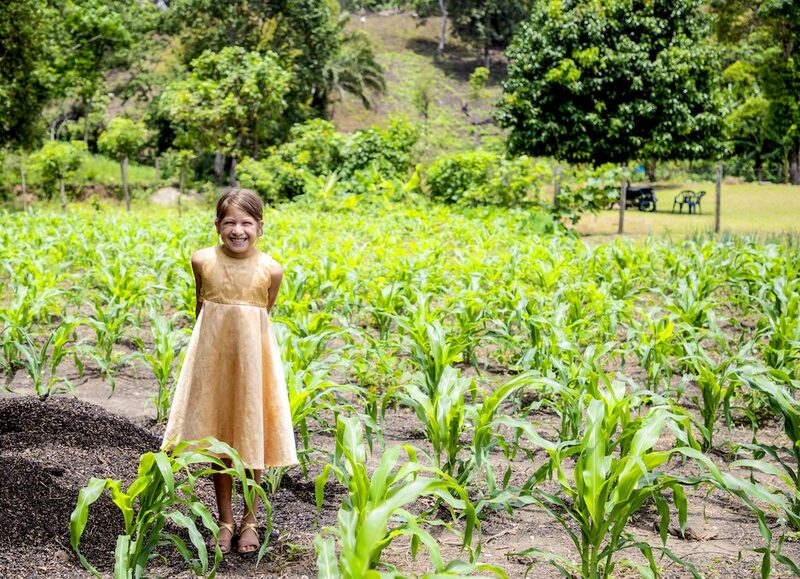 Two of Filadelfo’s daughters, Sandra and Keilin, were thrilled to be part of the gardening project, growing crops like onion, tomato, potato, corn and more. With their father working alongside them, their garden is thriving. 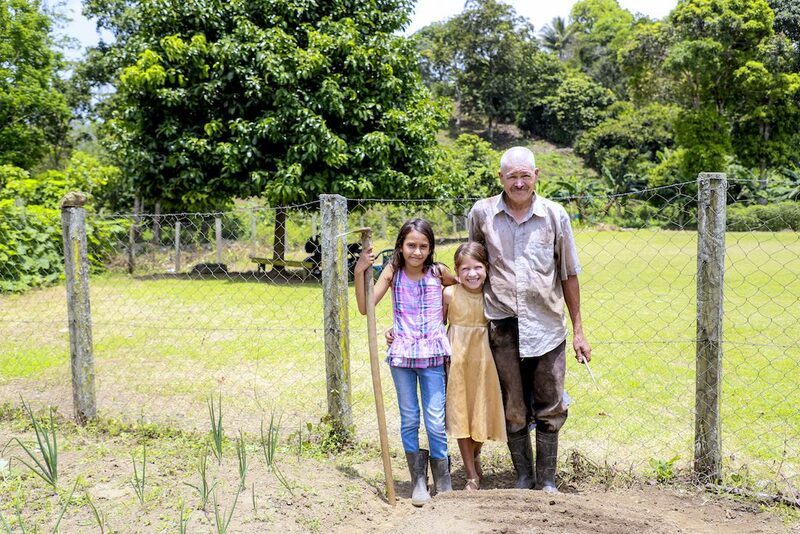 Sandra and Keilin enjoy farm activities with their father, Filadelfo. They have become very skilful since they also practice farming activities at their centre. “After the harvest, we enjoy going with our father to the market to sell the vegetables,” says Sandra. The initiative has allowed Filadelfo to provide for and protect his remaining family members. Parents are cultivating more than just good agricultural practices. Compassion staff are also running workshops to foster an awareness of the realities—and dangers—faced during migration, as well as financial investment strategies and money management. The project continues to yield a fruitful harvest. Parents are better equipped to feed their families and are earning additional income selling their produce. The initiative has also developed a sense of responsibility, teamwork and entrepreneurship amongst the children. And the church’s determination to help families live and thrive—together—has garnered the respect and admiration of an entire community.